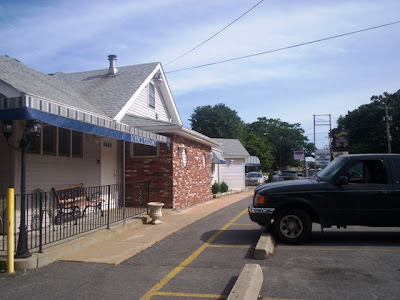 Mom and I have received a few suggestions recently to try two restaurants in Tiverton, RI - Nonni's Pasta and Barcello's Family Restaurant. Since Nonni's was about 30 seconds closer than Barcello's, and since I was already famished, we decided to stop by and have some pasta. Little did we know that there was a gas leak, and the entire plaza had been shut down. I mean, we saw the firetrucks, and the police, and the ambulances, but we still didn't get it. It actually took the woman at Nonni's to yell out, "Ladies!! We're closed! There is a gas leak!" for us to get back in the car after bypassing the emergency services. Fuming with anger and dying of starvation, I sped up the street and pulled into Barcello's. I was just praying that - due to the proximity to the Nonni's plaza - Barcello's didn't have a gas leak as well. Thankfully, the restaurant was open and free of toxic fumes. We entered the dining room at 3:20 p.m.
What a beautiful dining room! Mom and I just happened to be the only customers at the time, so we really got a chance to look around and take in the lovely atmosphere. Pretty lighted sconces and chandeliers hang over the tables, which are adorned with wine-colored, fanned napkins and stark white tablecloths. At the other side of the building is the lounge, which is separated from the restaurant by a swinging door. There were several patrons at the bar watching sports on the large flat screen television. After waiting for a few minutes, Mom and I were greeted by a friendly waitress, who seated us at a table by the window and handed us two lunch menus to look over. Although there wasn't a lot to choose from (there is much more on the dinner menu), each dish sounded better than the next. The waitress came over to take our drink order - two Diet Cokes ($2 each) - and then returned to the table to talk about the daily specials. 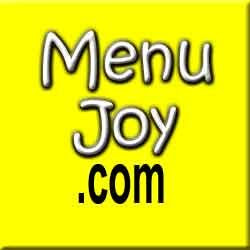 She mentioned a few things that sounded great - one of the dishes being baked stuffed scrod ($9.95). Normally I love baked stuffed scrod, but when the waitress told me that it was stuffed with Ritz crackers, I just couldn't get the image of a sleeve of crackers wrapped in a piece of fish out of my mind. Even though both Mom and I were still undecided, we quickly went with what sounded best. 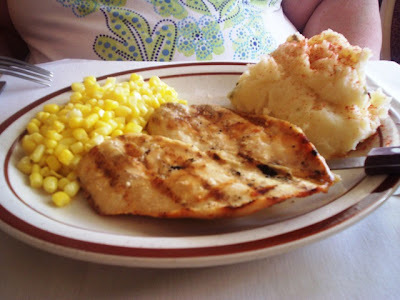 I chose the Barcello's style golden fish fillet ($9.95), while Mom chose the broiled chicken breast ($8.95). For my potato and vegetable option, I chose corn and house fries, while Mom went with corn and seasoned mashed potatoes. A few minutes after the waitress put in our order, she returned to the table with two very large, fresh Portuguese rolls and a take-out menu that Mom requested. They were excellent, and just the thing to get rid of my hunger pangs. The food actually came out really quickly, and it may have been because when we first ordered, we were the only two in the dining room. However, it was quickly filling up now that it was getting closer to dinnertime. After the waitress brought over some ketchup and vinegar for my fries, Mom and I dug into our meals. Her chicken breast was large and butterflied into two pieces. It had beautiful grill marks on it and you could tell that it had been resting in a sweet marinade before it was grilled. The chicken was cooked perfectly. The white meat was moist and tender, and the exterior had a smokey taste. The mashed potatoes were definitely homemade. They even had little lumps in them, which Mom loves. They were topped with paprika and parsley, which added a nice spice to their flavor. The corn was average and tasted like it came from the can. Mom enjoyed everything and said that it had an excellent taste. My fish was amazing! The golden batter on the large fillet was light, and didn't break when you cut it apart. Perhaps it was because it was topped with marinated yellow onions, which had a deliciously vinegary taste to them. 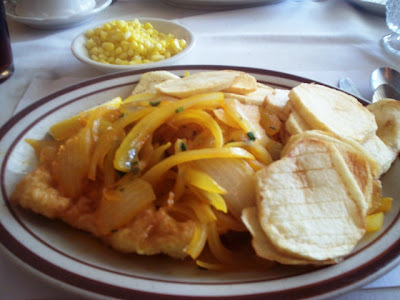 The house fries, or "chips", had a great potato taste and did not overwhelm the plate. The corn was ... corn. I don't know. It really didn't do anything for me. Perhaps I should have thrown some butter into the dish to give it some flavor, but I was too busy with my fish and fries to worry about it. Mom said that the look of my plate made her want to get an order of fish and chips on our next visit. We left $30 on the table, which included a 20% tip for the waitress. She was very good, and really seemed to know every customer that came into Barcello's. She also told us that she had given us the lunch price because we had arrived just after they started serving dinner. Both Mom and I swear that we had dinner portions because each plate had a large amount of food, which was fine with us! Before leaving, Mom and I decided to use the restroom. It was very clean and organized. 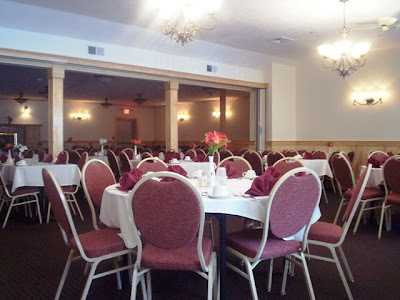 Although Barcello's is a family restaurant, it has a predominately Portuguese menu. Entrees include Paella Valenciana (market price) with lobster, littlenecks, mussels, scallops, shrimp, chicken, chourico, and rice; Codfish Gomes Sa, which is shredded sundried codfish with onions, potatoes, and egg ($14.95); Portuguese style sirloin ($14.95); and Portuguese style pork ($11.95). They also serve the popular shrimp Mozambique for an appetizer for only $9.95, and my sister's best friend really loves their chourico plate. Although Barcello's wasn't where we originally set out, we are certainly glad we ended up there. Who would have thought that a gas leak would have allowed us to try a restaurant that we should have visited years before? 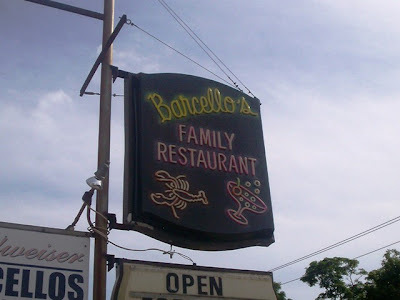 Barcello's Family Restaurant is definitely a place worth visiting, whether you're a local or just passing through. We just know that our fans are saying "we told you so", and they couldn't have been more right. We will definitely be back.